This had to be the most unusual first episode which piqued my curiosity because of the overall feel of the play and the manner in which the story was introduced. I didn’t feel like I was watching a drama on television but the pace of the play and dialogues were such that it felt like I was reading a novel; when you take the time to absorb every single word and occurrence. It was the kind of first episode which leaves you with a lot of questions and like any other script written by Khalil-ur-Rehman Qamar it had quite a few concise yet meaningful one-liners which were truly impactful. “Meri adhi jaidad aur puri nafrat ka malik hai vo” was one such one-liner! “Jis ko maal mil gaya, kisi ki mohabbat na mili, us ko mila hi kya” was another one which I absolutely loved. Generally the first episode of any drama introduces the viewers to the central characters and establishes their relationship with each other. This first episode however focused more on the feelings of all the characters for Waqar Ahmed (Imran Abbas) more than anything else. I am certain I am not the only one who is wondering why everyone hates Waqar so much. There were hints in tonight’s episode which suggested that he had betrayed someone (most probably Maheen – Ayeza Khan) he loved dearly because of which not only did Maheen suffer but everyone around her suffered in some way. Waqar thinks he had a valid reason for hurting everyone like that but the fact that Ami Begum (Saba Faisal) and everyone associated with him feels extreme hatred towards him suggests that he is the only one who thinks he is innocent. This first episode opened with Waqar Ahmed landing in Pakistan after eight years of staying abroad while Ami Begum talked about her will because she did not expect to live for long. The story started in 2017 which means that the viewers will see the background story in flashback scenes. The drama has a lot of characters but not all of them were properly introduced in this episode. Ami Begum’s love for Maheen was just as intense as her hatred for Waqar. It did however seem like while Ami Begum could never forgive Waqar but she could not forget him either. Ami Begum’s hatred for English language and Munshi’s dialogues about Waqar spending his youth in England went to show that when Waqar left for England Ami Begum did not expect him to stay there for so long. Waqar and Munshi’s conversations were the highlight of this episode. 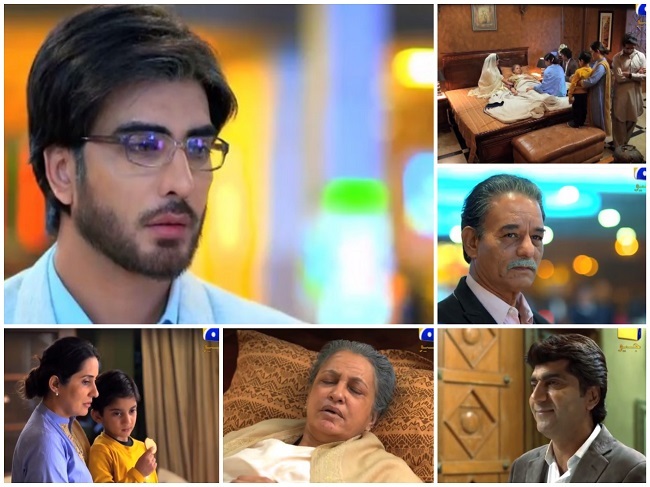 Imran Abbas and the actor playing Munshi’s role owned their respective characters and apart from the ever-present and rather loud background score everything else about these scenes was picture perfect. The enthralling performances, the impressive makeovers and situations which definitely give you a reason to tune into this drama next week made this episode a complete winner. Ayeza Khan and Imran Abbas have an amazing on screen chemistry which even made a drama like Tum Kon Piya a treat to watch therefore I can’t wait to find out more about Maheen and Waqar’s past and their story. Saba Faisal is turning out to be one of the best on-screen mothers who is constantly experimenting with different roles. The rest of the cast is also impressive, Sabreen Hisbani and Saman Ansari are personal favorites who always give every role assigned to them their best. Mohabbat Tum Se Nafrat Hai promises to be a story of love, betrayal, perhaps misunderstandings and bitterness. What makes someone who loves you with all their heart, hate you so much? Can’t wait to find out. This first episode suggested that emotions will reign supreme in this drama. The OST of the drama is beautiful and completely in line with the overall feel of the play. I was expecting something more commercial but it was definitely great watching a somewhat unorthodox start to this play. How many of you watched this first episode? Don’t forget to share your thoughts about it.